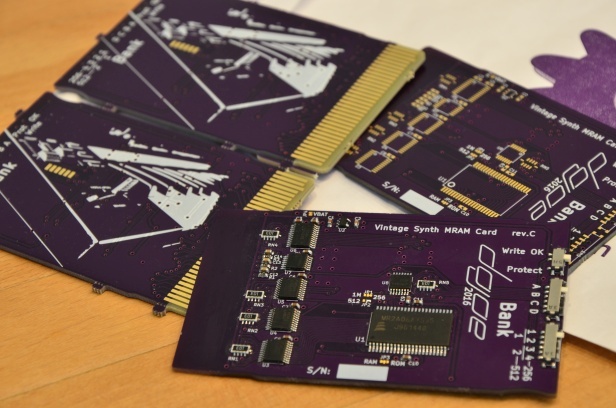 Since August 2014, we have been prototyping replacement cards for the legacy Roland memory card system. These cards work as replacements for the Roland M-128, M-256 and M-512 cards as well as the electrically identical Akai BR-16 / BR-32 cards. By means of bank switching, a single card can pose as sixteen M-128 / M-256 cards or eight M-512 cards. The card does not require a battery as it is backed by MRAM. The progress of this project has been documented and discussed on the Vintage Synth forum. The first batch of cards was sold out pretty quickly in 2017, and the second batch is now finally finished, and we are ready to take orders. We know you want one of those cards - Or maybe even two! And the best part ist, they cost just as much (or even less) as you would pay for an original card on eBay these days – while containing sixteen times (or eight times in the case of the M-512 cards) the amount of memory of an original card! While the card design is as close to the original cards as possible, there is a small number of devices that is not yet compatible with our replacement cards. Please review this list before buying a card. Tested and fully compatible: Roland D-5, D-50, D-550, D-10, D-110, D-70, JD-800, JD-990, JV-880, JV-1000, JV-1080, JV-2080, R-880 (GC-8), R-8M, GR-50, PM-16, TR-626, Akai MX-1000, VX600. Not compatible: Roland VG-8, Peavey Tubefex. Note: We'd love to support those devices too, but need one for testing. Please reach out to us via mail to mramcard@dojoe.net if you'd be willing to let go of yours for a few weeks. 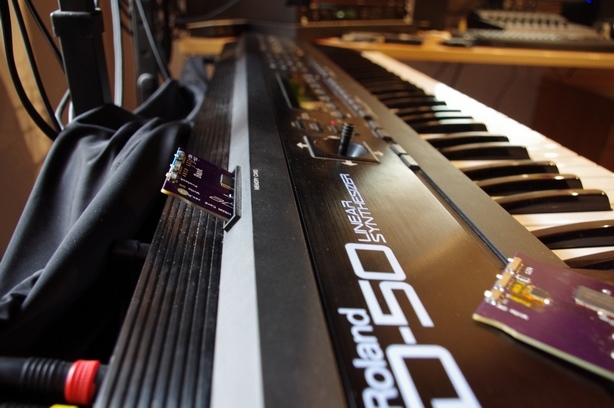 Some units like the Roland U-110 and U-220 only accept ROM cards, not RAM cards. Naturally, this RAM card replacement does not work in those, either. Other devices will most likely work as well (in particular if they are similar to the tested ones), but are not tested. Please let us know about the results if you tested the card with a device not mentioned on this list! We have assembled a small manual with some instructions and a list of frequently asked questions, you can download it in PDF format (last update: 1 November 2018). We have been crushed by our own popularity and are currently out of stock! However, we will produce more cards, and if you fill in the form below, we will notify you once we have cards in stock again. We will send the good news about the memory card to this address. Note: This is not a pre-order form! You can still change your mind and not buy a card, and we can not guarantee a free spot in the waiting queue for the cards. We will merely use this data to inform you about the availability of the memory card.